Ultrasound is a medical procedure that allows health care professionals to examine and monitor fetal growth during pregnancy. It is also used to diagnose and examine various other ailments and health conditions. The ultrasound is often an exciting prenatal test for expectant parents as it allows them a chance to get a glimpse of their new baby. Gender identification is not usually a medically necessary procedure but it can be done if the baby moves into the right position. 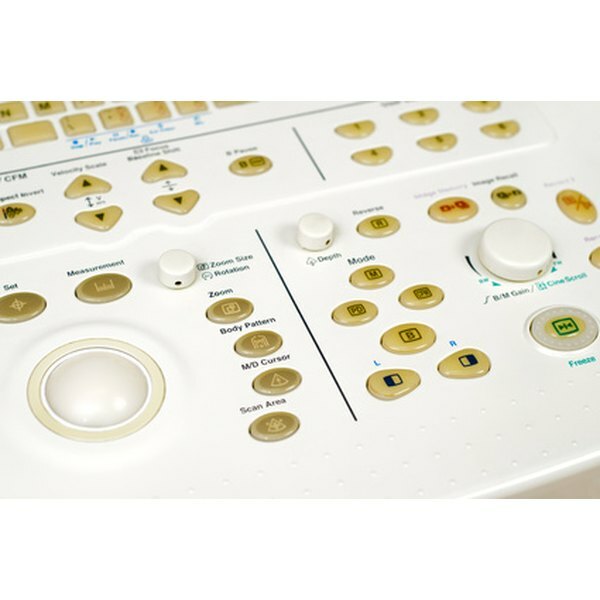 Ultrasound exams are performed with a transducer that emits sound waves through the body, specifically into the womb where the fetus is located during a prenatal ultrasound. When the sound waves hit tissues they reflect back painting a relatively clear picture of the baby and all things in the womb. This picture is often easier for a trained ultrasound technician to understand but the later the ultrasound is done in the pregnancy the clearer the picture. Higher-tier ultrasounds that use 3D or 4D technology can reveal an even clearer picture of the baby for the untrained individual to review. The number of ultrasounds performed within one pregnancy varies greatly depending on the woman's pregnancy and the health care provider. Very early in the pregnancy, between the sixth and 10th week, an ultrasound may be done to confirm the pregnancy. This generally reveals a very small embryo and a heartbeat about eight weeks after conception. Any time before 20 weeks an ultrasound can be done to measure the baby and establish an estimated due date if the woman is not entirely sure about her ovulation dates. Any time after 18 weeks of pregnancy an ultrasound can be done to reveal the gender, screen for birth defects and other pregnancy issues. Additional ultrasound exams can be done throughout the pregnancy when a woman or her baby have been identified as high risk. The transducer emits sound waves wherever the technician directs them. During the exam, the technician can review whatever parts of the baby are openly displayed within reach of the sound waves. If the baby is turned or tucked into a tight position, it may be more difficult to view her more minute details, including fingers, toes, gender and facial features. Many ultrasound technicians, especially those who specialize in obstetric exams, are prepared to help make the baby move during an exam. Moms are often encouraged to drink plenty of water during the early months of the pregnancy to make the fluid levels optimal within the womb. When a baby is in a less than ideal position the mother may be asked to lie on her side, get up and move around or carry out various other movements to help jostle the baby a bit. Drinking a carbonated or sugary drink right before or during the ultrasound can encourage the baby to move. An ice cold drink may also be given to wake the baby. Coughing, laughing or talking are other simple things a mother can try. Sometimes the health care professional, such as the obstetrician or midwife, will feel the baby for size and position in the later months of the pregnancy. Doing this can wake the baby and encourage him to move. Persistence is key if it is important that the baby move during the ultrasound. When all methods have failed the exam may need to be rescheduled for a time when the baby is more active. Carrying more than one fetus, such as twins or triplets, can make it even more difficult to examine specific features of the babies, including gender. Getting the babies to move may be easy but this does not necessary mean the desired features will be visible. The babies only have so much room to change position and make examining special characteristics easier. As the pregnancy progresses the baby may move but it may not be significant enough to reveal things that include gender or facial features. Toward the end of the pregnancy, the baby can become engaged in the mother's pelvis in preparation for labor. This position is instinctual and snug, making efforts to get the baby to move futile at times.